I loved the book. At first I found it a teensy bit boring but I continued to read it though and I'm glad I did, because after a few more pages, I was hooked! I can't really relate to the book except for having the older brother. I can also somewhat relate to her and Conrad. But it feels like I can completely and utterly relate to her whole life. 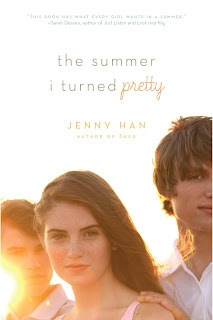 So I guess that means Jenny Han is a pretty good writer. :P This was my first read by Jenny so yeah. I loved it! Belly is.... Belly is an awesome nickname. Haha :P I seriously which I had that nickname. It's awesome! I understand her though. She's a cool kid. Especially when she talks about Taylor, I completely get it. Conrad. *sigh* He's just Conrad. All tough and stuff. Oh well what to do. What to do. I can't wait to read the next book in the series but my library doesn't have it! Gr... Anyways, I loved this book and yeah. It was awesome. Would I recommend this book and to who? Yes. To people who want to read something realistic and not paranormal whatsoever but still want read romance.